Egyptian Storm, a 3-year-old half sister to Triple Crown winner Justify, has been retired from racing and booked to top sire Quality Road. Owners Robert S. Evans and West Point Thoroughbreds will offer the daughter of Pioneerof the Nile out of Stage Magic, by Ghostzapper, in one of the Kentucky breeding stock sales in November.When Egyptian Storm came out of her lone start on February 20 with a splint injury that would have prevented her from racing until the summer, her connections decided her best future would be as a “collector's item” broodmare. 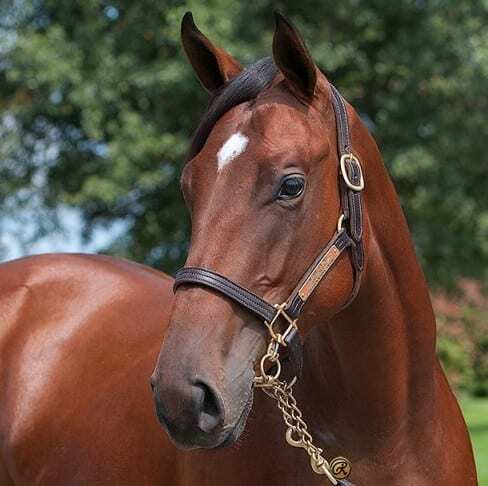 Evans and West Point bought Egyptian Storm at the 2017 Keeneland September yearling sale, more than four months prior to the career debut of Justify, who would soar through six career starts and retire as the only unbeaten Triple Crown winner. Egyptian Storm's pedigree has also been boosted by another half brother, The Lieutenant, who became a Graded stakes winner in 2018 and is now at stud in New York. This entry was posted in Bloodstock and tagged egyptian storm, Justify, Pioneerof The Nile, Quality Road, Thoroughbred Auctions by Press Release. Bookmark the permalink.